In a recent blog post, the Information Commissioner, Elizabeth Denham has dispelled some myths about the forthcoming GDP legislation. Scaremongering in the media has led some businesses to feel fearful of the maximum £17 million or 4% of turnover penalties allowed under the new law. It has also been falsely reported that these increased fines will help fund the work of the ICO. For the ICO, issuing fines has always been and will continue to be, a last resort. In 2016/2017 they concluded 17,300 cases and only 16 of them resulted in fines for the organisations concerned. There is new legislation arriving in 2018 which affects anyone who carries out email marketing. The General Data Protection Regulation (GDPR) is the EU’s new privacy law and it’s due to be enacted on 25th May 2018. Its aim is to bring uniformity to a plethora of different legislation across all member states, and to replace the Data Protection Act and the Privacy & Electronic Communications Regulations (PECR) which are no longer fit for purpose. GDPR will affect every company that uses personal data from EU citizens. If you collect email addresses and send marketing emails to subscribers in the EU, you’ll have to comply with GDPR — no matter where you’re based. Penalties are due to increase significantly up to a maximum of €20 million or 4% of global annual turnover. 1. New subscribers will need to affirm that they want to opt in. This affirmation must be via a dedicated subscription form, or via an unticked check box in situations where you’re collecting data for other reasons, such as order processing or membership applications. Pre-ticked boxes or “Tick here to opt out” will not be permitted. 2. You will need to tell subscribers how their data will be used. For example, if they give you their email address to download a free article you must tell them if you plan to use that email address for marketing purposes and give them the option to opt into this. 3. You will need to keep a record of consent. For example, if you use a provider such as Campaign Monitor they will store details of how and when a recipient subscribed along with their IP address. It is not clear at the moment whether such information will be sufficient. I’ll monitor how this will need to work in the coming months. 4. The following commonly adopted scenarios will no longer apply. (i) An existing business relationship will no longer imply consent. For example, where you have an existing database of customers and suppliers and you use that for email marketing. (ii) The current soft opt-in where you can email people if there is an existing business relationship. 5. You will need to get your existing data up to GDPR standards. If you can’t provide sufficient proof of consent for existing subscribers, you won’t be allowed to contact them anymore. You will need to run a re-permissioning campaign. This includes subscribers you have added using soft opt-in. I’ll be working with all existing Expertise on Tap clients to ensure they are compliant when the new legislation comes into force. If you are not a client and need help running a re-permissioning campaign do let me know. There are other aspects to GDPR in addition to email marketing. There’s more information here from the ICO. 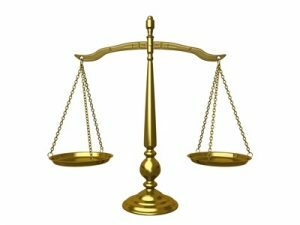 The above content should not be used as a substitute for professional legal advice. Watch this video I produced for Cheltenham Chamber of Commerce. Matthew Clayton from Willans LLP talks about GDPR and how it will affect businesses. Charlton Kings Film Society were planning showing the “Eddie the Eagle” movie and asked me to film an interview with Eddie, with their Chairman Dan Harris. Here’s the result. Orchard Press, based in Ashchurch near Tewkesbury approached me because they knew they should be using video to promote their business, but needed guidance on how to go about it. They wanted to be able to use a promotional video to demonstrate the breadth of services they offer using their state of the art equipment, including the only Heidelberg B1 press within 50 miles. After several discussions I was able to devise a storyboard and write a voiceover script. Filming took place during two sessions. The resulting film is below. With thanks to the hugely talented Guy Harris voiceoverguy.co.uk for the ultra fast turnround and high quality delivery. Rather than just rocking up with a camera and hoping for the best, with my commercial and business background I am able to guide clients on the best approach for their video. Many SMEs tend to commission videos because they’ve read that they “must have a video on their website”, but without knowing how a video might work best for them. My starting point is to always open any discussion with “why do you want a video?” which then enables me to guide them on the most effective approach. These vital preliminary discussions help to speed up the process, and more importantly help to avoid surprises later on in the process, because both parties are aligned from the outset. I’m delighted to have completed another video for long-standing client Gala Events. This one was filmed at Edgbaston “the home of cricket”. It features former England captain Nasser Hussain and former Australian international player Glenn McGrath. I’m delighted to be producing member profile videos for Cheltenham Chamber of Commerce. Here’s the latest in the series featuring Richard Cole and his visiting tailoring service. Twitter video. Achieve real engagement with your followers. I don’t often post about social media as it’s not one of my core services. However, an app update for Twitter just came through on my iPhone, and it made me genuinely excited. The app update said, “Now you can shoot, edit and share video on Twitter”. What’s so special about this? You can already share video on Twitter can’t you? You just link to YouTube. What’s different is it now takes the possibility for real engagement with your followers to a new level. That’s because you can shoot videos of up to 30 seconds from within the Twitter app. You can even edit the video by re-ordering the clips. Social media evangelist Gary Vaynerchuk explains this much better than I can. Time is so incredibly precious to people. They hate when it’s wasted, and they are impressed when you give them some of your time. That is what excites me most about Twitter video. Giving time to people. More time. Personalized time. And that is awesome. So, next time you receive a Tweet with a question about your business, or maybe an idea or a complaint, you could use a short Twitter video to respond to them. It takes me nine to twelve seconds to make a video and reply, but those extra seconds hold a lot of meaning. Not to mention it’s more personal, visual, and we are living in a world where the visual is often regarded as a better engagement than the written. It works in a similar way to Vine. You just tap and hold the record button and then release. If you wish, you can tap again to record more clips. You’ll see the duration counter change colour as you get closer to 30 seconds. If you want to re-order the clips just tap, hold and re-position. 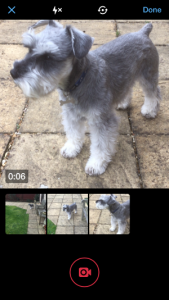 Tap “done” and your video will then be embedded it a new Tweet, and you can also add text. Lee Rickler of Point & Stare for the Vaynerchuck blog post link. When you create your e-newsletter or e-shot, if you’re using an email service provider such as Mailchimp or Campaign Monitor, a plain text version is automatically created for you. It’s vital to include a plain text version otherwise ISPs will assume your email is from an untrustworthy source and could block it as spam. Another reason is some recipients prefer to read in plain text rather than HTML. In fact, some corporate email systems still use plain text as their default. It’s also important that you then edit your plain text version, not just to aid readability but also to increase the chances of conversion. Campaign Monitor have produced some excellent tips on plain text emails. As a provider of email marketing services, I recommend to my customers that they should have a clear and simple approach to enabling website visitors to opt in. No boxes to be pre-ticked. For the user to opt in to what they want to receive, rather than tick a box to opt out. To have a uniform approach. Ie. Do not have a mixture of “tick this box to opt in to X” and “tick this box to opt out of Y”. A bad example is the one below on the Royal Mail website. 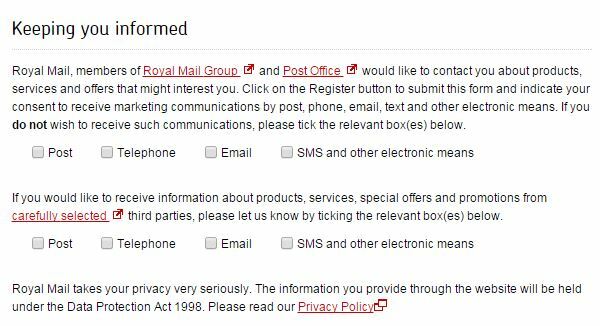 The first selection of boxes requires the user to tick the boxes if they do not wish to receive marketing from Royal Mail. The second selection of boxes asks the user to tick the boxes if they do wish to receive marketing from third parties. The problem with this is the second set of boxes requires an opposite action to the first set. A busy or impatient user, having ticked the first set of boxes may well gloss over the instructions for the second set, and repeat the box ticking exercise, thus unwittingly opting in to receive marketing from third parties. I was privileged to be asked to film the Remembrance Service in Bishops Cleeve on Sunday 9th November 2014. Here is the completed video.